Ray Comfort is doing a study of the Gospel of Luke at his blog, Atheist Central. "However, thanks to Bruce and his Bible, I was inspired during the following night to begin a comprehensive atheist Bible study on the Gospel of Luke. Why Luke? Because that’s what I had been reading and thinking of how atheists should read this wonderful book. So, we are going to give Luke an autopsy and dissect every verse, scrutinize it, find out its meaning, and leave the conclusion to the skeptic who has dared to set aside his prejudices and look solely at the evidence, wherever it may lead him. My hope is that, as with each of the four gospels, it will lead you to the cross. Feel free to join me. Get your scalpel ready. Here goes..."
"God was the author, and men were simply the "pens" He used to communicate His Word to humanity. Does it live up to this claim? After searching the Scriptures daily for almost 40 years, I am persuaded beyond doubt that it does. 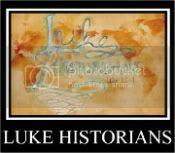 Luke was also the (Ghost-writing) author of the Book of Acts. As a doctor, his narrative is methodical, and very meticulous. The book was written around 60 years after Christ (1). It begins, as does the Book of Acts, by addressing a man named "Theophilus." It would seem that this "most excellent Theophilus" was a Roman official, and not merely a friend or associate of Luke. Yet nothing is known about him from other historical evidence. Perhaps he was simply a Roman officer who expressed an interest in Christianity, and who better to write to him than a man who said that he "had perfect understanding of all things from the very first"? So the question comes down to, do we trust Doctor Luke? Should we unquestioningly swallow everything he prescribes in this letter? Of course not. More than 200,000 people die each year because they trusted the medical profession(2). Honest skepticism is healthy. The reason why Luke wrote to Theophilus "an orderly account," was that he "may know the certainty of those things in which you were instructed." In a world of uncertainty, Luke was hoping to give him the certainty of a solid rock upon which he could build--an "anchor of the soul" upon which he could trust."